Wales head coach Warren Gatland. THE SIX NATIONS is a tournament that deserves praise for being ultra-competitive, Warren Gatland said after overseeing his side to a narrow victory over France that saw them finish second in the championship. In a hard-fought encounter at Cardiff’s Principality Stadium, Wales beat the French 14-13, thanks to three first-half Leigh Halfpenny penalties and a Liam Williams try. Jacques Brunel’s French XV responded with a Francois Trinh-Duc drop-goal and a converted Gael Fickou try, Maxime Machenaud’s sole penalty the only score of the second half. The result saw Wales finish second behind Grand Slam winners Ireland, with Scotland in third after beating Italy, France fourth ahead of England in fifth and winless Italy left with the wooden spoon. That last-gasp drop-goal saw the Irish beat France 15-13 for a rare away win to set them on course for five from five victories, rounded off by the 24-15 win over England on Saturday. Cardiff’s match was equally tight, heavy on defence and light on quality attack. 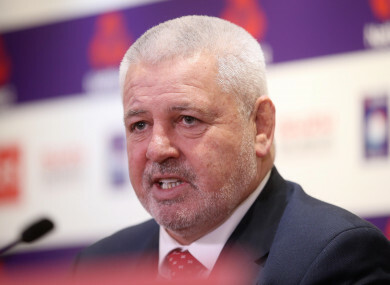 “I’m extremely satisfied,” Gatland said of the result. “It was an ugly performance in terms of it wasn’t pretty, but we spoke beforehand that we just came here to do a job and the job was just to win and finish second in this competition. Brunel acknowledged that the competition was a mixed bag for France. “Yes, there’s disappointment among the players and coaches because once again it’s a match we could have won,” he said. “At the start of the tournament, people said we were very distant from the big nations. But we showed we were very close. Email “'Congratulations to Ireland... they deserve that, but they'll know they were a little bit lucky as well'”. Feedback on “'Congratulations to Ireland... they deserve that, but they'll know they were a little bit lucky as well'”.